The MCOR Magnet Correction Power Supply Modules are capable of providing precision Bi-Polar output currents with models ranging from ± 1 Amps output up to ± 30 Amps output. 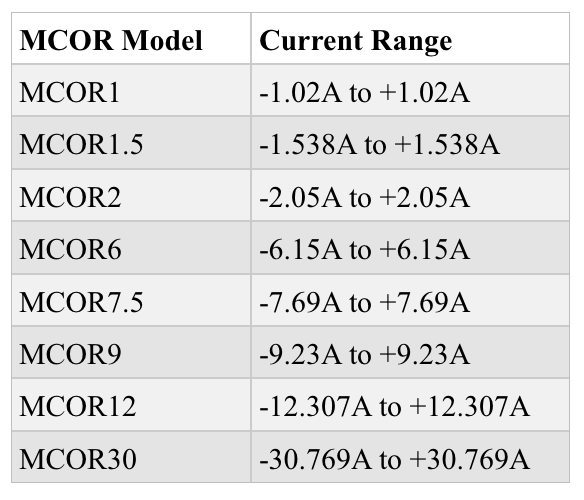 Eight MCOR models (see Table I) are currently available . The modular architecture allows for up to 16 MCOR (MCOR Models 12 and below) or eight MCOR Model 30 modules, to plug into one 6U crate. The crate also houses a single EMCOR Controller (Ethernet MCOR Controller module) that can control all MCOR modules residing in the crate. The EMCOR Controller Module, in addition to controlling the outputs of all of the MCOR modules in the crate, also monitors feedback and monitor currents of the MCOR outputs, as well as ripple and fault conditions. The EMCOR controller is a new product that allows for Ethernet and USB Interface connections. This new controller replaces the obsolete C4 Interface module. To find out more information about the models of MCOR modules available, use the links below. 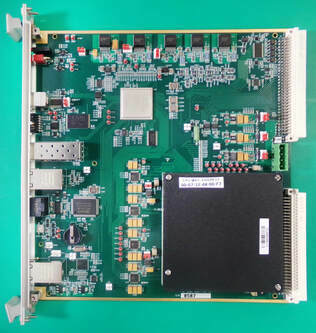 The Ethernet MCOR (EMCOR) Controller module was designed to be used in conjunction with an MCOR Crate and up to 16 MCOR Power Supply modules as the Controller assembly for all 16 MCOR modules. The EMCOR module comes equipped with its own CPU module. Ethernet and USB interface connections are available and can be used to control the output level of all MCOR modules, as well as monitor and feedback current, ripple, and fault status of all 16 channels simultaneously. Current and Ripple measurements to the EMCOR module are provided by each of the MCOR modules using indepepndent readings (Monitor and Feedback readings) in the form of an analog voltage. The ADCs of the EMCOR module digitizes and stores the data making it easily accessible for monitoring purposes. The EMCOR module has the ability to control all different MCOR module types in the same crate. 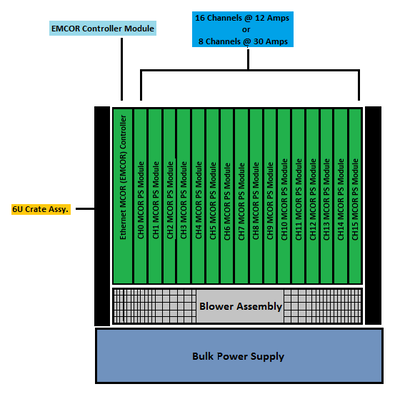 Power for the EMCOR module is supplied by the crate. A single Bulk Power Supply supplies the power outputs for all MCOR modules residing in the crate. The EMCOR Controller module replaces the C4 Interface Module, which is now considered obsolete.